Often times, rushing into installing the unit can result in serious damage to your DCDC-NUC UPS board or computer. Always double check the polarity of your wires with a voltmeter. If I(Out) > 2A and T(ambient) > 30°C, open air operation. In order to prevent premature battery damage due to thermal exposure, always check NUC-UPS board temp and ensure it does not exceed 55C for your application. 13.2.1 The first main screen is the "Status-UPS"
13.2.2 The second main screen is the "Status-Charger"
13.2.3 The third main screen is the "Settings"
The NUC-UPS was designed to provide +12V regulated power output from a wide input voltage(6V-38V). It has a range of intelligent functions not found in any of the traditional USB converters. the motherboard on/off pins. This makes it an ideal device for automotive or battery powered installations. or above battery voltage level. It charges the battery in three phases: preconditioning, constant current mode and constant voltage mode. provided to flash the new firmware. the title bar of the software. For configuration purposes only the unit can be started by connecting the unit to USB. Inserting the batteries should be the first step to perform. Waking the unit for the first time implies applying input voltage. The operating modes can be selected by setting the NUC_UPS_MODE parameter to 0(DUMB mode) or 1(AUTOMOTIVE mode). Further parameters can be customized by changing in the Parameter List. When in this mode the unit still works as an UPS or it can be used as a general purpose battery pack. In this mode starting can be performed either by applying input voltage or pressing the button for 500ms. 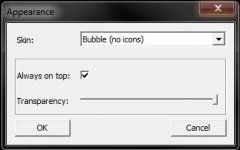 In this mode stop sequence can be initiated by pressing the button for 500ms. In this mode Starting can be performed by applying input voltage and applying ignition voltage. filter out unwanted noise in automotive environment. duration set by the IGN_COUNT parameter. -one of the cell voltages is less than UPS_VCELL_MIN_STOP parameter, shutdown sequence is initiated. -the unit is on battery for more than UPS_ON_BATTERY_TOUT parameter, shutdown sequence is initiated. -one of the cell voltages is less than UPS_VCELL_MIN_HARD_STOP parameter, shutdown is immediate. -one of the batteries temperature is out of the limits set by the DCHG_TEMP_COLD, DCHG_TEMP_HOT parameters. -overload, when the maximum allowed discharge current exceeds the value set by UPS_OVERLOAD parameter. If output is out of regulation the unit is immediately stopped. The following options are available to control the motherboard by pulsing the on/off pins on the motherboard. First the the motherboard On/OFF pins should be connected to the P5.1,P5.3 pin on the P5 Interface_connector. Example:If startup of the motherboard is not needed when input is present, the startup pulse can be disabled by setting CONFIG1.b0 to 0. The same way the shutdown pulse can be inhibited by setting CONFIG1.b1 to 0. 1. Enable this feature, CONFIG1.b2 should be set to 1. In order to enable this feature CONFIG1.b3 must be set to 1. The charger is a Synchronous Buck-Boost converter capable of charging the batteries with an input voltage below, equal or above battery voltage level. • The charging is starting with a preconditioning phase, where the current is limited to ~350mA. The preconditioning phase has a minimum duration set by CHG_COND_TOUT which is extended if one of the cells voltage is below the limit set by CHG_CELL_VCOND. • In constant current phase charge current is limited to 1A. After battery voltage rises to the value set by the hardware charger, the charger will enter constant voltage mode. • In constant voltage phase the battery will absorb less current as time passes and charge current will decrease. When the charge current decreases below ~150mA, charging is stopped. During low power state the charger is disabled, so the charger module is also disabled in automotive mode when the Ignition is OFF, even if input is present. Charging will be terminated if a global charge timer elapses, this can be set by CHG_GLOBAL_TOUT parameter. Charging is limited to precharge value if one of the batteries temperature exceeds limits set by CHG_TEMP_COOL,CHG_TEMP_WARM parameters. 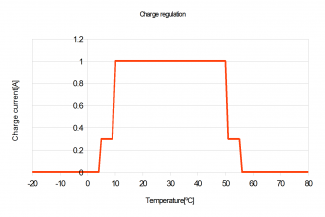 Charging is terminated if one of the batteries temperature exceeds the limits set by CHG_TEMP_COLD,CHG_TEMP_HOT. In order to work properly the following conditions when changing parameters must be fulfilled: CHG_TEMP_COLD < CHG_TEMP_COOL < CHG_TEMP_WARM < CHG_TEMP_HOT. 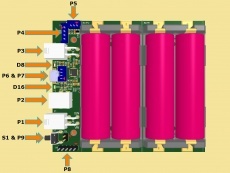 The temperature sensors are located just below the batteries for proper temperature detection of each cell. The balancing algorithm is voltage based. Balancing is allowed if cell voltage exceeds the value set in the BAL_VCELL_MIN parameter. Balancing is started if the voltage difference between the cells is higher than BAL_VCELL_DIFF_START, and will be stopped if the difference is lower than the value defined in BAL_VCELL_DIFF_STOP parameter. The unit has two LEDs on board (Red and Green), located on the right and left side of the USB connector. While there are scenarios where both LEDs are blinking with a certain pattern, the LEDs generally help identifying the power source that runs the UPS output at any given moment. The blinking patterns that can occur during operation are shown in the images below. The duration of LED blinks can also be seen on the images, displayed in milliseconds. will initiate shut down procedure. "Never" is allowed as value (to disable this feature). Default is "Never". If input voltage is below this threshold, the output is powered from battery. Default is 8000mV. Input voltage filtering. Default is 100ms. Ignition voltage filtering. Default is 100ms. If ignition voltage is beyond this threshold, ignition is considered to be ON. Default is 6000mV. If ignition voltage is below this threshold, ignition is considered to be OFF. Default is 5000mV. After ignition is considered ON, the PSU will wait this time before the output is turned ON. Default is 2000ms. After the motherboard boots up, the ignition voltage sensing will be disabled for this period. Default is 60s. After the output was turned on, the UPS will wait this period before sending the ON pulse to the motherboard. The length of the start-up/shutdown pulse sent to the motherboard. Default is 500ms. 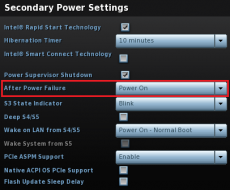 After the shutdown pulse is sent to the motherboard, the UPS will wait this period before the output is turned OFF. This time-out allows the operating system to perform a clean shutdown. Default is 60s. b1 - If set, shutdown pulse is enabled through the PWRSW connector. b0 - If set, startup pulse is enabled through the PWRSW connector. Depending motherboard alive status the shutdown/startup pulse is sent if b2/b3 is enabled. The motherboard presence can be smartly detected if b2/b3 is enabled. For example: In case motherboard is already shut down the pulse is not sent in case of a shutdown scenario. This is also true in case of a startup scenario. Battery Capacity. Default is 1000mAh. Filtering time for button pressing. Default is 100ms. If Vin is not present and all the battery cells are above this threshold, the UPS can start and will run on battery. Default is 3.6V. preserve battery. Default is 3V. during this time. Default is 30 sec. Maximum allowed bulk charge voltage/cell during constant current/constant voltage charging. Default is 4.1 [V/cell]. exceeds this value, charging is immediately stopped. Default is 100mV/cell. If cell voltage is below this value, charging can be started. Default is 3.85V/cell. Global charge timeout. Default is 240 min. timer before applying a small topping charge - in case other cells are still not charged. Default is 60s. This value will be summed with the measured cell voltages, this is a calibration parameter. Default is 0mV. If the voltage difference between cells exceeds this value, cell balancing will start. Default is 80mV. If the voltage difference between cells is less than this value, cell balancing will stop. Default is 40mV. Open Circuit Voltage State Of Charge detection for initial 0% fuel gauge estimation. Default is 3.3V. Open Circuit Voltage State Of Charge detection for initial 10% fuel gauge estimation. Default is 3.68V. Open Circuit Voltage State Of Charge detection for initial 25% fuel gauge estimation. Default is 3.76V. Open Circuit Voltage State Of Charge detection for initial 50% fuel gauge estimation. Default is 3.82V. Open Circuit Voltage State Of Charge detection for initial 75% fuel gauge estimation. Default is 3.97V. Open Circuit Voltage State Of Charge detection for initial 100% fuel gauge estimation. Default is 4.17V. If output power measured is higher than this threshold the connected motherboard is considered to be ON. Together with POUT_LOW_THRESHOLD parameter sets a hysteresis for motherboard status. CONFIG1.b2 must be set in order to be active. Default is 3000mW. If output power measured is lower than this threshold the connected motherboard is considered to be OFF. Together with POUT_HIGH_THRESHOLD parameter sets a hysteresis for motherboard status. CONFIG1.b2 must be set in order to be active. Default is 1000mW. Windows OS should recognize it as a generic HID USB device. voltages, currents and other parameters which can be dangerous if they are set without precaution. The first main screen is the "Status-UPS"
machine, voltages, currents, temperature, different read only state flags. The user also have the possibility to log the current state into a *.csv file in the "Log" section. The second main screen is the "Status-Charger"
The third main screen is the "Settings"
This is recommended to be done only by experienced users. Any parameter of the NUC-UPS can be set from here. parameter list a helper text is displayed (same from this manual). values to the NUC-UPS. IMPORTANT: without this step the new values will be lost, nothing is sent to the NUC-UPS! to the settings.ini file. You can disconnect the current NUC-UPS from the USB and insert a new one, than press the "Parameters: NUC-UPS <=== File (settings.ini)"
button to send the last saved configuration into the new NUC-UPS. etc.) and contains the full set of parameters in human readable form. occurs during USB communication and/or NUC-UPS flashing operation. Please try again and contact our support team only if the device gives this error 4-5 times in a row. "always on top" capable small window. try icon. The "skin*.mbs" files are simple text ones editable with any text editor (notepad for example). playing with the values from the new file. 100=success, 0xF1-0xFF=failure See the examples for usage. IMPORTANT: the API supports only one NUC-UPS connected to the computer. This page was last modified on 11 February 2019, at 05:10. This page has been accessed 367,461 times.